About 6 months ago, Neghar Fonooni wrote about her decision to seek out female identifying creators and craftspeople in order to do her part to fight the wage gap. She was speaking specifically to her decision to seek out only feminine presenting artists for her tattoos in this particular piece, although she has cultivated this idea in other aspects of her life and business as well. It struck a chord with me. All my tattoos have been done by men so far, why is that? My knee jerk reaction is because there are more male than female tattoo artists. But what part do I play in perpetuating this? Rad women tattooers are definitely out there and as I soon learned, may better identify with the imagery I’m interested in wearing. So I made it a mission to find some amazing female talent in Alberta for my next tattoo, since there always seems to be another one on the go in my mind at this point! And I’ve essentially been following and loving on some killer artists ever since, three of whom just opened a brand new shop in South Edmonton called Enchanted Tattoo Studio. The next piece I’m planning is a semi large lower back tattoo to cover up a semi small ugly tramp stamp I’ve had and hated on for 21 years. You didn’t even know I have that one, did ya? It’s actually a reminder of a fairly dark period in my life, one that will always be a part of me but doesn’t need to be physically represented on my body in this way anymore. A few years after I got it I asked another artist about covering it and was told that I was scarred and the tattoo was too dark to do anything about. Getting it covered with something beautiful has been a bucket list item forever, and has now officially made it to my 41 before 41 list (which is in the book that I am going to finish this month, SO HELP ME.) I was on the hunt for someone who loves doing cover-ups and is amazing at the elements I’d like to incorporate. Jen Danger at Enchanted is a cover-up specialist who has been tattooing for 10 years. She has created a huge book of stunning previous work, is amazing at feminine details and is a Disney MASTER. She is a gifted illustrator who loves tattooing the things that come right out of her head, so her book of flash tattoos is just as stunning as her custom work. 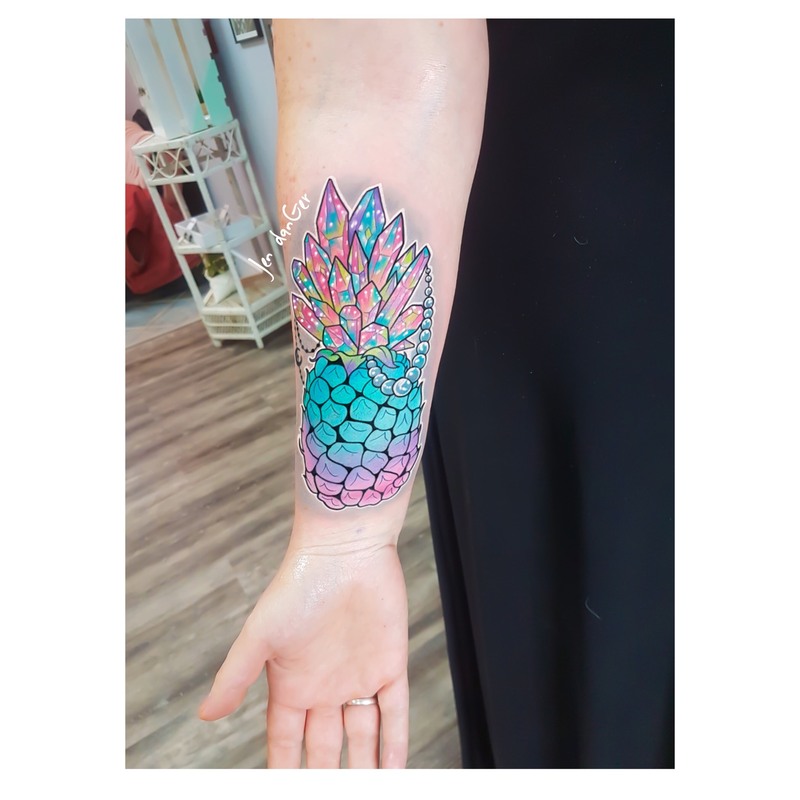 It was one of these flash pieces, a colourful pineapple wearing sunglasses, which convinced me I needed some of her art on my body. Something about that cheery little snazzy pineapple made my heart happy. He was snapped up immediately by another fan of Jen’s work. Jen’s flash pieces are also one of a kind, so when someone buys one it’s no longer available to be tattooed on anyone else. And buying one can land you on the short list for the appointments she reserves in her schedule for tattoos she is really excited to do, which I learned first hand this week. Tattooers have an etiquette all their own and the good ones often have a fairly extensive vetting process. Being thoughtful, patient, and respectful of this process is a good way to inspire beautiful art. The wait to get into a popular artist for custom work can be anywhere from 2-12+ months, with most landing somewhere in the 2-6 month range. This pace suits me. As a naturally anxious person I like having a good lead up to big events. I sent an email to her assistant in late August for a consult on the cover-up, and scheduled an appointment with Jen for the next day she was opening her books, Oct. 22. On October 2nd she posted a new drawing, a new flash pineapple but this one in a different colour palate, its top adorned in brightly coloured crystals in place of leaves and dripping with beads. I fell in love. The day of the consult with Jen about the back cover-up finally arrives! I drive the two hours to meet her and fall in love with her shop immediately, the mix of crystals and antiques and taxidermy appealing to my creepy, girly aesthetic just so. I also love Jen and her easy smile immediately. 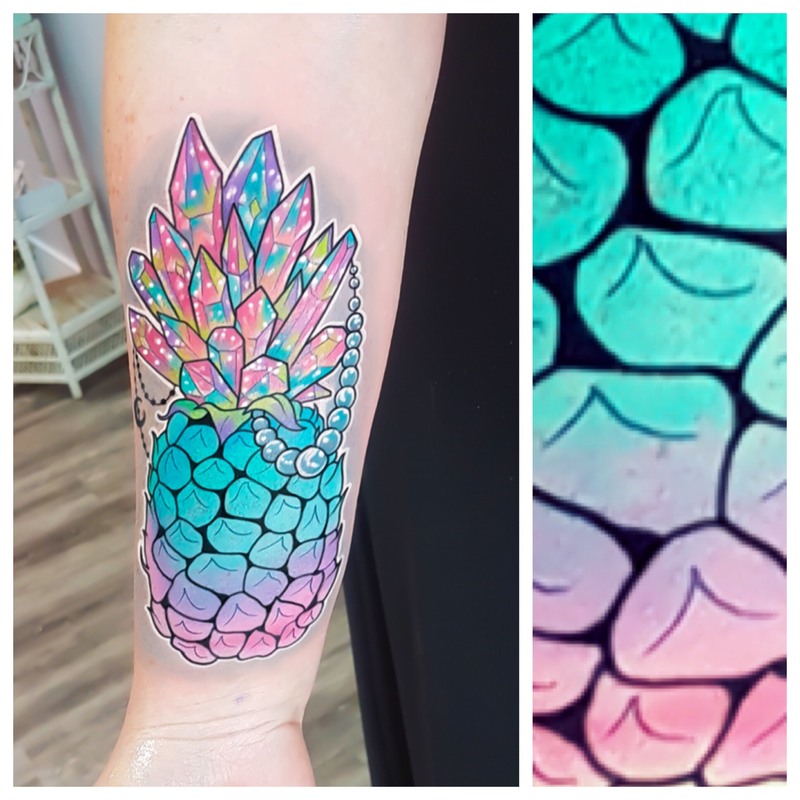 I have a great time telling her what I’m after and hear the words I’ve been waiting 17 years to hear: “oh yeah, that’s nice and faded, it will be no problem to cover it.” We start talking about the things I have in mind for the tattoo, and get to talking about the crystal pineapple drawing. She says “he’s still up for grabs! No one nabbed him so I put him away in my book. If you want him, he’s available.” I’ve thought about this drawing every day for a month and am shocked. “Maybe when this one is done?” I stammer out, gear wheels already turning. Two days later I found myself still thinking about the pineapple, so I sent her an email telling her as much and asking what the cost would be and if she has any flash days coming up. She replies and says no, no flash days coming up. But I have time to do this tattoo on the 29th. My reply was something along the lines of OMFG THAT’S THIS WEEKEND! INTO IT. My husband was working out of town for the week and the inquiry escalated quickly. When he got home Friday evening he said something along the lines of “a crystal pineapple on Sunday huh? Why Amber?” A few other people on my page asked a similar question so I thought I would write about why I knew this drawing belonged on me! First, there is the saying I love about pineapples standing tall, wearing a crown, and being sweet inside. I’m a tall woman but I haven’t always held my head high. I like the reminder . The crown bit is less about being a princess and more of a reminder to take care of myself #LikeAQueen. (Be sure to check out Erin Brown’s new book, Like a Queen, when it comes out sooooooon). And the sweetness inside, well, it’s a part of me that I nurture. I’m proud of my heart, even more so now that I see it radiated back at me and outward into the world through my children. I’m also proud of the tough and slightly spiky skin I’ve built to protect myself when needed, too. Second, an insane pineapple is how some of my favourite strong women refer to their topknot hair do when they lift; the bigger the pineapple the bigger the PR, or something. I channel those women when I workout by piling my hair high on top of my head. Now I channel them throughout my day by glancing at my forearm, too. Third, I’ve been hoarding crystals since a witchy ballet teacher gave me my first quartz when I was 11 years old. They’ve calmed me and empowered me and centred me and sung to me for years. Some days stronger than others. Some years stronger than others. They always call me back. Fourth, I am also a suns and moons worshiper; an agnostic with pagan leanings that feels the compulsion to marvel at the sky with wonder, often. Our moon moves oceans with its proximity. It’s power is enormous and rhythm undeniable. A nightly reminder of the renewal that is possible every single day, of the inevitable regeneration of life. I’m happy to play homage with a tiny moon on my arm. Finally, I love full colour, saturated, and bold illustrative art and tattoos. The colours in this drawing grabbed me immediately. It’s playful, feminine, and beautiful. It highlights my spirit fruit and my spiritual side. And it’s mine all mine. I will admit though, that so far this has been the most painful of all my tattoos. I made a rookie mistake and brought a strange pair of headphones to my appointment that I couldn’t get to work with my phone, so I had a tough time zoning out while she was working. The fumbling with my headphones while Jen patiently waited to tattoo me thing made my anxiety about being tattooed that much worse. After a few minutes of trying to connect my Bluetooth unsuccessfully I gave myself a little pep talk about accepting this new reality and sat like a rock for most of the session. But the lack of distractions made the nearly 4 hours of constant saturation pretty rough at times. I learned quickly that killer colour comes at a price and that price is a ton of pain. There were times that it felt like a hot match on my skin, not a needle. Not the most fun ever. Luckily my mom came along to keep me company and Jen can tattoo and talk at the same time and didn’t mind answering our one million questions about her career and art while she hurt me. I learned that she was essentially discovered to be wasting her life at an office job by another tattoo artist because she spent all her free seconds drawing and someone she worked with passed along her art. I learned that she thinks she isn’t great at drawing, despite the thousands of stunning pieces she’s done over the years. I was reminded that people who care about their art are often critical of it, that even someone who is fully booked on consultation days for months in advance and has a giant portfolio of beautiful pieces still has her doubts. I learned that Jen has a similar attitude to me when it comes to helping new people to her industry and learning from her peers. Her abundance mindset shines brightly. After my appointment I had to drive 2 hours home, which is a pretty long haul for fresh ink. By the time I got home my arm was throbbing and I was thrilled to open the Tylenol. The sleep that night was rough. My kid is fighting the elementary school plague and between that and the anxiety about hurting my new art I didn’t sleep much. The day after I was completely wiped and extremely sore, all the way up to my shoulder. I spent most of the day laid up on my couch with an ice pack. Day 2 was much better but it was Halloween so it was a long day as a mama. Today I feel human again. My entire right arm is still sore and achy, but it’s better. I was able to remove the plastic bandage in the shower on Wednesday, a lengthy and painful ordeal that I was so ready for. The tattoo itself is starting to get itchy and feels like a bad sunburn to the touch, but it looks amazing. I’m eager to see how bright it will be in a few weeks when it’s actually healed. My entire experience at Enchanted was excellent. The shop itself is clean and beautifully decorated and tailored to those who identify with their feminine side. The other two resident artists in the shop, Erin Storm and Nikko Adams were also working on beautiful tattoos during my appointment, and the amount of talent and experience shared between the three women makes their shop a new powerhouse in the Edmonton tattooing community. I’m so thankful Neghar challenged my perspective about who does the work on my body and that I subsequently found a shop I look forward to supporting for years to come. And I’m over the moon in love with my new tattoo and cannot wait to show off the next piece she is working on for me in the New Year. If you want to get in touch with Enchanted Tattoo or their artists, a great place to start is here on their Facebook Page. Or you can find Jen Danger directly here. As always, you can follow me here on my Facebook page or here on Instagram. Insta is the place you are likely to find shenanigans like visits to the tattoo shop. If you do end up finding an artist you love at Enchanted because I’ve turned you on to them, please tell them you found them because of me. They’ll take great care of you! Thank you so much for stopping in and reading, Heather! This was a long piece, I really appreciate you taking the time and am glad you enjoyed it. All the best!